Thanks to M-PEC members' effort, the 6th M-PEC Festival could be successfully shared with citizens in the area of Myoko, Itakura, Takada, Naoetsu, etc. Directly or indirectly, we could received various kinds of generous support, encouragement, and so on during this preparation, which I am grateful for. Above all, in spite of that I am a troublesome man for the officers in this local administration and education, two presses: "Joetsu Times" and "Myoko Channel TV" kindly came to collect data or take a video; I must thank their courage very much. I believe it is my old and new teachers that have brought up me, running LL Shihoya Arai School for 38 years; thanks to them, we can continue this unique club: Myoko Powerful English Club (M-PEC). Under current economic depression or so, making props for Drama: "Prancer" couldn't finish until a few days before November 18th; because I couldn't help imposing big burden upon R, the word: "quit" crossed my mind many times. 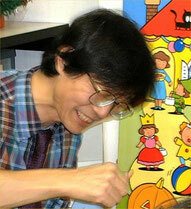 Needless to say, the chairman, Hosaka did his best. This year, I couldn't afford to ask advisers of M-PEC to write "Message to the 6th M-PEC Festival" except only two: Ms. Kohara and Professor Wright. We could get lots of happy incidents, too. Though I can't tell you all, but...e.g. 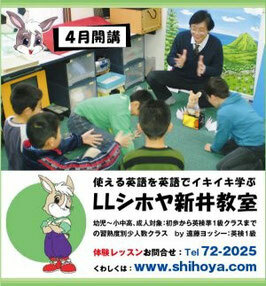 Ms. Chisato Kohara in Tokyo visited LL Shihoya Arai School where M-PEC members could learn how to pronounce in this drama. Ms.Yap (a teacher of teaching language of English in a senior high school in Malaysia) has been sending forward to me many "wonderful or peaceful pictures, PPT, You-Tubes and so on to make us relaxed". In those days just before this festival, most members gathered at a few additional rehearsals in LL Shihoya Arai School with his/her supper, practicing the drama until late at night. 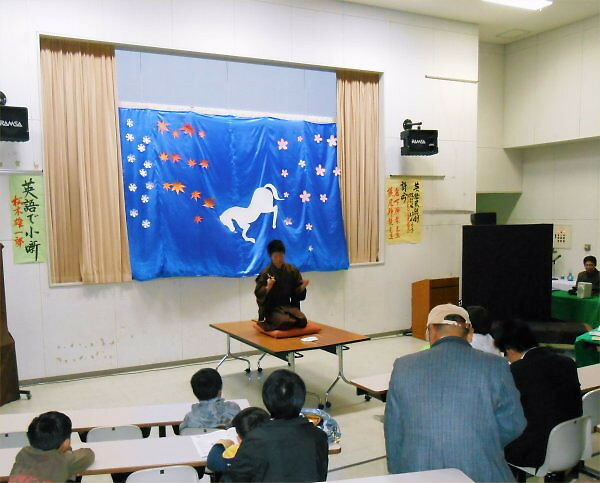 That day, one of LL students of LL Shihoya Arai School, Yuichiro Matsuki (3rd grader of Takada Senior High School) performed rakugo-styled funny and short story, which made the audience surprised and moved a lot. The other adult-members can't do it yet, though. When Yuichiro wearing kimono: (Japanese old fashioned cloths) was coming up to the stage made of two long office-desks in the music of below-the salt, he suddenly fell down heavily because one desk was unlocked. I. e. As you know rakugo has always a punch line at the end of it; he unexpectedly performed two punch lines in his telling before and after! (This wit was told by a member of genius: Mr. Yasuhiro Kawamura at the thank-you party.) Fortunately he was safe! One of my biggest surprises was that one of my best respected teachers and friends, Mr. Mitsuo Miyata suddenly came to this festival from Tokyo. 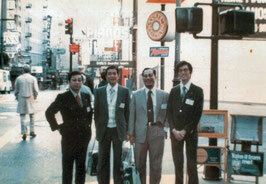 His status is now "Chairman Center for Research in English Education in Japan in Nihon Eigo Kentei Kyokai". 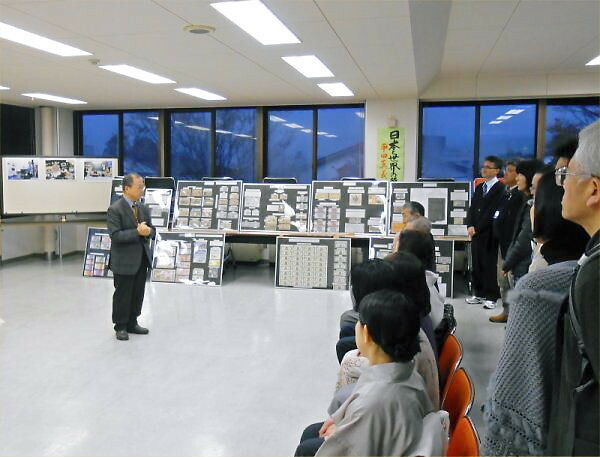 Not only enjoying one of the corner: "Making Picture by using Torn-paper", but also he was kind enough to receive my request; he gave the participants his precious short speech about "a present situation of teaching English in Japan and the other countries". According to some of his, e. g. "The average of command of practical English in the students of college is around the 3rd Eiken! ", "If we couldn't master enough abilities of using practical English now, which means that we couldn't do any business with foreigners! ", etc. Though if told the same words as his, my words must be much lighter than his in this local area; the audience was all ears being transfixed in front of him while listening to his calm and deep way of speech. I am eager to make a special lecture by him, however, I know I can't as of now because of lack of my power and popularity; I'm ashamed for him. But some day, I wish this dream would come true! The theme of this Festival was "There is Life beyond Art: Find My Art!" 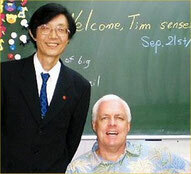 (Proofread by Professor Wright) As Mr. Shingi Hirata usually says "Make bigger Jin (human) -ternet! ", Yoshy would like you including me not only to brush up the 4-skills of English but also to make their vessel: "impressive movement of happening to meet someone", which Yoshy want to keep as long as I live. I'm afraid we Japanese are not still good at logically arguing each other yet. Yoshy sent some of my friends my essay, in which I wrote; "Bears often haunt between a mountain and resident-area. Landslides often occur just after big earthquake. - I imagine one of the main reasons might be too many golf-zones in such a small Japan, don't you agree?" As soon as my sending, two respected friends replied me with a little bad mood in their lines. Hoping this case would be fewer than I expect, but I should say to myself, "Most adults tend to ignore or get angry whenever such tiny incidents seem to attach them. ", which is maybe increasing in these digital world. If we adults couldn't debate or share with about any problem consciousness, our next generation would imitate our behavior; how do you think? Yoshy is going to continue "M-PEC monthly lesson: Yoshy's English Activities：YEA" from next day: December 7th (Sat. ), of course... but, whether next the 7th Festival could do or not depends upon serious desire with holding his/her resolution : "Never leaving necessary task to other persons!" 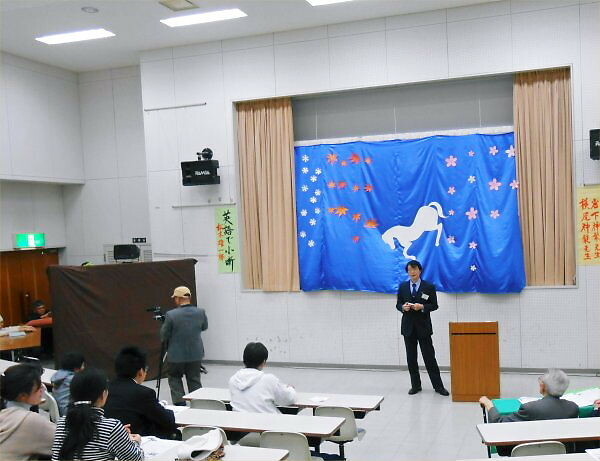 After this Blog, I should enter another big task: the final preparation of "SW Niigata Prefectural Speech Contest in Nagaoka" as a acting chairman. It is already at the beginning of snow-falling now. 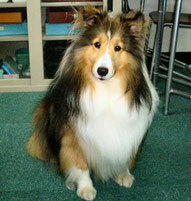 Please take care of you living in Echigo: Niigata-ken, Japan.